So, here we are with another sweet baked good....but, I did have a good excuse this time as it was my husband's birthday on friday :) I was planning on making something quite different (which I won't mention now in case I ever get around to it!) but couldn't do as tofutti cream cheese is getting hard to find - there's a little hint for you! 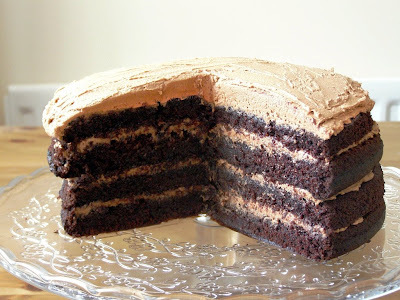 Anyway, decided to just make the chocolate wacky cake again as it's so good, but, decided to go a little more decadent and make it four layers with a very yum chocolate 'butter'cream. It turned out very good, these aren't the best pics but the cake is so moist and light against the rich, fluffy buttercream. I was also thinking of drizzling a ganache all over the top of this but then calmed down and regained my senses! They aren't in the photos but I served this with fresh strawberries which went so well with it. 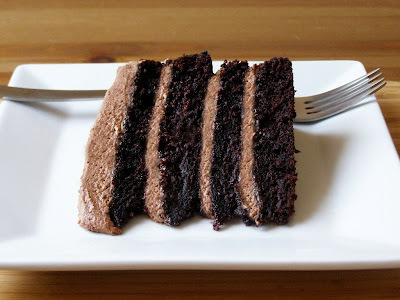 Chocolate Cake: Best to make these the day before. Grease and line two 7 or 8 inch round cake pans - set aside. Preheat oven to 350F/180C. Combine all dry ingredients and whisk well. Combine all wet ingredients and whisk well. Pour the wet into the dry and gently whisk until just combined. Pour evenly into the two pans and place in the preheated oven for about 30 minutes. Check with a toothpick, it should come out clean or with just a few crumbs clinging to it - mine needed 35 minutes. Place on a wire rack to cool but leave them in the pans, they will split while cooling if you remove them. When cool remove from the pans, wrap firmly in cling film (again to prevent splitting) and place in the fridge overnight, this will help prevent splitting and will make slicing the layers easier. Cream the margarine and sugar in a stand mixer, when it starts getting dry add the chocolate and quickly mix until incorporated. Add cream in stages until you get a nice, thick but spreadable frosting. Remove the cakes from the fridge and place on a cutting board. Using a long, thin serrated knife slowly and carefully cut the cakes in half. It really isn't as hard as it sounds as long as you go slow and keep turning the cakes, don't worry about cutting the centre until you've worked around the edges. Place the top layer, top side down on to your serving plate and spread with some of the frosting. Place the other cut layer bottom side up on top and frost this. Repeat with the other cut layers and then frost the top with the remaining frosting. Serve with fresh strawberries. Really nice photos, it looks so yummie! Thanks so much Carolina! I am late posting your comment here, hope it all turned out well!